Last week, I took a look at how the Yankees and Phillies match-up well for a trade for immediate relief and future considerations, and as it turns out, the Phillies are interested in Yankees reliever-once-acclaimed-starter Joba Chamberlain. As Feinsand points out, the Phils would be interested in dumping the salary of Michael Young (the Phillies are on the hook for $6M), which would likely mean Freddy Galvis or Cody Asche would be called up into everyday duty. In 88 games with AAA Lehigh Valley, Asche has 21 two-baggers, nine steals, eight homers and a .787 OPS. Galvis has underwhelmed, slashing just .217/.250/.304. If Joba were acquired by the Phillies, Michael Young and his .329 wOBA would probably become the Yankees’ new corner infielder, similar to what Kevin Youkilis was supposed to be. Photo Credit: H. Rumph Jr. of the AP. When the husky 21-year-old right-hander from Nebraska burst unto the scene in 2007 with an electric slider and even more jolted fastball, the Yankees thought they had the next Roger Clemens on their hands (0.38 ERA in 24 IP with a SO/BB Ratio of 5.67 and .75 WHIP). “Joba Rules!,” Yankees fans cried, as the actual rule initiated by Yankees hierarchy prevented him from throwing consecutive days and an extra day of rest for each IP in an outing. The following year, Chamberlain’s ’08 campaign showed continued signs of success– 10.6 SO/9 with a 2.60 ERA in 100 IP, with 12 starts (ironically, his first start came against none other than Roy Halladay) under his belt. As you’re surely aware, Chamberlain’s ’09 campaign as a starter was pretty disasterous (4.75 ERA, 1.54 WHIP, career-worst 1.75 SO/BB ratio), which prompted the Yankees to shift Chamberlain to setup man in 2010. A tale of two halves, Chamberlain struggled mightily in the first half of 2010 (5.79 ERA in 37.1 IP with a 1.50 WHIP), losing his setup job to David Robertson, who has it to this day. After the All-Star Break, however, Chamberlain once again proved to show signs of that electric Mariano heir: 34.1 IP of 2.88 ball with an opposing OPS of .648 and 4.63 SO/BB rate. Losing his spot in the pecking order to Kerry Wood towards the end of the season, Joba hasn’t been the same since. After undergoing Tommy John surgery in 2011, suffering a freak trampoline accident in 2012 and telling noted-gentleman-and-greatest-of-all-time Mariano Rivera to “don’t shush me,” it’s pretty apparent Chamberlain has worn out his welcome in NY, with a 4.13 ERA (ERA+ of 103), WHIP of 1.40 and 3 BB/9 since 2011. Likewise, Phillies utility infielder Kevin Frandsen could also receive expanded playing time, and it’s worth noting he hit .338/.383/.451 in full-time duty last year (1.6 WAR in 55 games last year according to Baseball Reference). 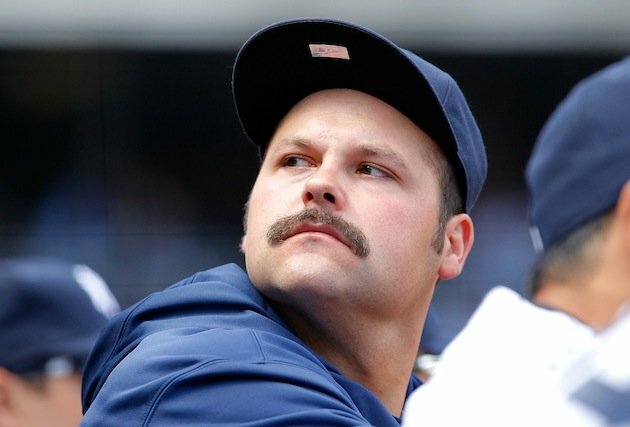 But in the land of hypothetical, what would the Phillies be getting in Joba Chamberlain? With Phillippe Aumont sent back to Triple-A due to command issues, Mike Adams’ three tears in his shoulder ending his season and an otherwise shaky relief corp very similar to the one that contributed to last year’s worst eighth inning ERA in MLB, the Phillies would have to be confident in their ability to re-sign Joba in the off-season if they were to deal for him. Assuming Chamberlain’s ceiling is the second half of 2010 (keep in mind, Chamberlain is still only 27), he’d be a nice piece to have next to Papelbon. All this is dependent on whether or not the Phillies see themselves as buyers or sellers, but so far so good in this crucial home-stand. Remember, the thinking among the Phillies is that they can still contend with names like Lee and Papelbon next season while the Michael Youngs and Carlos Ruizs of the world are expendable. Of course, the Yankees would likely have to send over a controlled piece over, such as a C prospect like 2b Angelo Gumbs. Ultimately, however, for two teams on the fence of contention and mediocrity, this is a match-up that would help both; the Phillies would aide their bullpen woes while getting younger dumping Michael Young, while the Yankees would get consistent production from the right-handed side. Last Saturday, the Phillies placed first baseman Ryan Howard on the 15-day DL with left knee inflammation, but with a torn meniscus discovered, Howard’s subsequent surgery and recovery time of six-to-eight weeks may push the Phillies to sellers rather than buyers. The 33-year-old Howard posted a 110 OPS+ this season, and is owed $20mm this season, with annual payments of $25mm starting in 2014 and all the way up to his age 37 season. General Manager Ruben Amaro Jr.–who signed him to a 5-year $125mm extension back in 2010–publicly called out Howard for “not getting the job done,” citing the fact that Howard has become a very expensive platoon player with a penchant for breaking down (who was the one that signed him to the extension?). 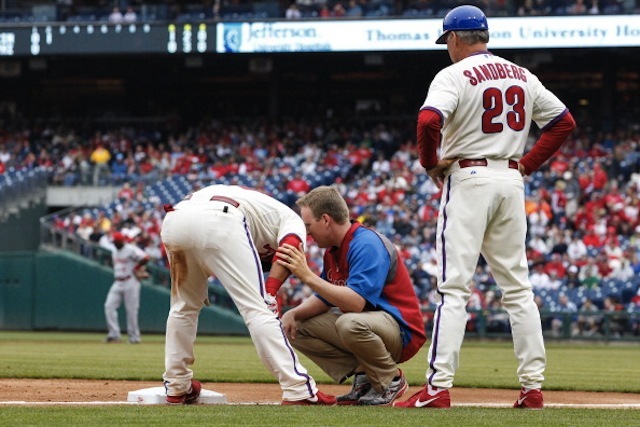 Since 2007, Howard has seen leg injuries pile up; a quad injury in 2007; an ankle injury in 2010 with a torn Achilles in 2011 on the last play of the Phillies season, and arguably, their National League dominance. Howard, who was hitting .266/.319/.465 this season, averaged a .961 OPS until his mega-deal in 2010. Since then, an OPS 145 points lower at .816 while the OPS has gone from 143 in his peak years to 118. Three games under .500 at 43-46, the Phillies would have a lot of pieces to sell, including Michael Young, Carlos Ruiz, Chase Utley and Delmon Young. Perhaps Cliff Lee and Jonathan Papelbon could be moved, but the Phillies feel as if they can still contend with those two pieces on next year’s ballclub. With Howard likely out until mid-September, this paves the path for an everyday opportunity for Darin Ruf, who captured Philadelphia with his 12 game cup of coffee last season. Ruf hit .266/.344/.408 in 82 games with Triple-A Lehigh Valley before being called up on Saturday. With just 5 PAs in the Majors this season, it’d be foolish to suggest Ruf will continue to slug .750, but, his .351 OBP in the aforementioned 12 games last season is just 29 points off the career .380 OBP he posted in the minors. With Amaro Jr. stating the Phillies current home-stand is “crucial,” whether or not they will be buyers or sellers, this news out of the injury ward certainly hinders their chances of holding on to the dynasty that brought them “World F-ing Champions!” in 2008. After matching up particularly well in the 2009 World Series, the Philadelphia Phillies and New York Yankees make excellent partners again, but not in the grand theatrics departments but, instead, for (multiple) trades. A season-high five games under .500 at 39-44, the Phillies need to face reality, and that is their core of the Utleys, Rollins, Howards and Hamels of the world are either fading stars (Utley and Rollins), a platoon bat (Howard), or an ace in the midst of an unlucky season with little run support. It’ll be a tough day in the City of Brotherly Love, but a necessary one for the future. The future for the Phillies could come from the now team that arguably started their postseason downfall and has since seen more injuries than a PSA. Despite scoring 10 runs–their most since May 10–against the Twins last night, the New York Yankees certainly haven’t been the Bronx Bombers this season. Featuring a bottom-five offense which happens to have the third-worst OPS (.681) and a wRC+ of 83, the 43-39 Yankees need help, and fast. Although Alex Rodriguez (hip) has just started his rehab assignment, the offense has taken a huge hit with the loss of Derek Jeter (broken ankle), Mark Teixeira (season-ending wrist surgery), Kevin Youkilis (likely season-ending back surgery), Curtis Granderson (hand), Francisco Cervelli (hand) and Eduardo Nunez (ribcage). With veterans like Lyle Overbay and Vernon Wells regressing not only into pumpkins, but jack-o-lanterns-still-up-at-Christmas levels of staleness, there could perhaps be a package of players discussed between the two teams. In order of a likely transaction between 2009’s best teams, here are the players that will likely find themselves on the move sooner rather than later. Although Phillies President David Montgomery admitted to Ken Rosenthal the team is hesitant to start selling, Jim Salisbury of CSNPhilly.com reported last week that the Yankees have discussed acquiring catcher Carlos Ruiz. Given that the Yankees’ catching has hit a combined .233/.299/.336, Ruiz would be an immediate upgrade, especially against left-handed pitching (.800 career OPS), the Yankees’ biggest vice this season ( just a .649 OPS). The 34-year-old Chooch is owed about $2.5mm before becoming a free agent at season’s end, which makes Ruiz even more attractive for the Yankees given their desire to get under their self-imposed $189mm payroll cap next year for luxury tax purposes. Although Ruiz is slashing just .261/.316/.295 in 98 PAs this season, the Phillies would likely get something decent back for Ruiz, and his heir–Tommy Joseph–will likely be a September call-up. Ruiz isn’t the only free-agent-to-be that would interest the Yankees, however. Acquired just a week apart from each other, the Yankees would have loved to seen Kevin Youkilis post a .344 OBP with 105 OPS+. Unfortunately for them, Kevin Youkilis would play in 28 games, missing just about all of May with a lumbar strain in his spine, which would eventually turnout to be a herniated disc in his back, causing the once-Greek God of Walks to undergo back surgery, which puts him at a late-September return barring no setbacks. 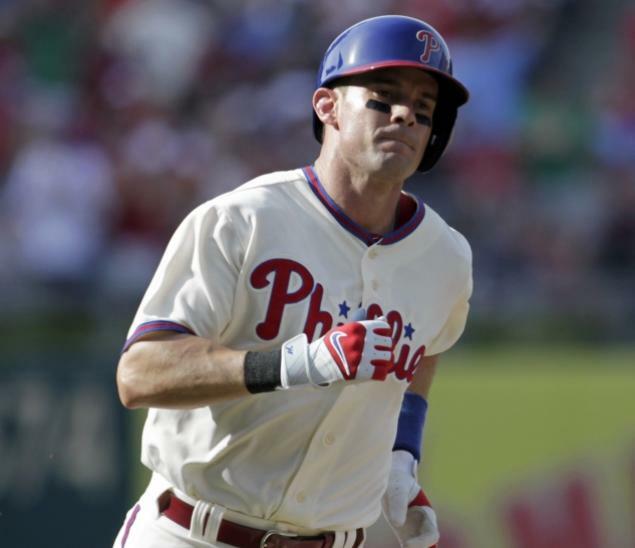 The aforementioned numbers, however, belong to Michael Young, and though he’s shot defensively (-6.1 UZR this season), the 36-year-old third baseman would be a welcome sight as New York’s third baseman/designated hitter given David Adams’ egregious .103 slugging in his last 20 games. When Rodriguez returns, Young and his career .312 average against LHP could slide into a platoon with first baseman Lyle Overbay. Kevin Frandsen would likely be Young’s immediate replacement barring something unforeseen, and if 2012 was any indication, Frandsen could handle full-time duties if necessary. From July 31 onward last season, Frandsen hit .338/.379/.448 in 54 games with just 18 strikeouts. Of the $16mm owed to Young, $10mm is being paid by the Rangers, and in this land of hypothetical, both the Yankees and Phillies would be paying $3mm. However, Young is not only of interest to the Yankees, but the Red Sox, who, according to George King III of the New York Post, “want him [Young] badly.” Boston recently demoted struggling Will Middlebrooks to AAA. Yankees third basemen have combined for a wOBA of .260, while Boston’s hot corner sits at .323, respectively. Hitting his first major league home run in Yankee Stadium on May 23, 2009, John Mayberry Jr. admittedly fitz the Yankees perfectly; either in the outfield or in a first base platoon, similar to what I suggested with Michael Young. With the Yankees originally acquiring Vernon Wells to provide the right-handed power in the outfield otherwise filled with LHBs Curtis Granderson, Brett Gardner and Ichiro, it’s pretty apparent Wells is just about done at this point, with just eight extra base hits since May 1, hitting .184. Mayberry’s .750 OPS would be fourth-best on the team, and his .846 OPS against LHP would be over 1oo points better than Wells’ .733. Unlike Young and Ruiz, Mayberry is controlled until 2016, and will be arbitration-eligible for the first team next season. Obviously, it would require a bit more from New York’s side to pry away the strikeout-prone Mayberry (21.6 K%), which would lead to a Darin Ruf cameo or having Delmon Young play right every game for the remainder of the season. Although no one has come right out and said it, at least in the Phillies organization, it’s looking more and more likely the Phillies are shopping Chase Utley, despite Ruben Amaro Jr.’s desire for Chase Utley to “remain a Phillie for life.” The Orioles, Royals, A’s and even the Dodgers have been interested in the “The Man,” but that discussion is for another day. Despite missing a month due to an oblique injury, Utley has remained consistent, posting a wOBA of .371 this season, which isn’t far off of his career wOBA of .377. Of course, Robinson Cano remains entrenched in New York, but it’s worth noting Utley has some experience at first base; 24 games. In 25 PAs at the New(ish) Yankee Stadium, Utley has hit .300/.440/.300, with two of his five World Series homers coming in consecutive ABs in Game 1 of the 09 World Series. If–and that’s a large if–the Yankees do acquire Utley, it wouldn’t be too shocking to see them discuss a one-year deal for 2014. While Utley provided the offensive fireworks for the Phillies in the 09 World Series, there’s one more name on this list that could conceivably make sense for New York, but on the pitching side. A target of the Yankees’ desire ever since the trading deadline in 2010 (ironically, the deal fell through due to an injury to the aforementioned David Adams), Cliff Lee would make sense for the Yankees not only this year, but for the future as well. Spurning the Yankees and Rangers after the 2010 season, it’s looking more and more likely that Lee could wind up on one of the aforementioned teams with the return for the Phillies needing to be “astronomical,” at least according to Jon Heyman of CBSSports.com. Lee is in the midst of a typical Lee-ian year, with a 2.59 ERA (2.57 FIP) striking out a ton (23.7%) while walking none (4.3%). Lee’s friend and former rotation-mate CC Sabathia is dealing with declining velocity and isn’t looking very ace-like with a 4.15 ERA with his HR/FB ratio on pace to be a career-worst 13.9%. Add in the ineffectiveness of Andy Pettitte since returning from the DL due to back issues (17 ER in his last 36.2 IP); likely goner Phil Hughes (4.41 FIP); a shaky David Phelps (opposing .766 slugging in last five starts); returning Michael Pineda and Lee suddenly puts the Yankees over the top. The only problem, however, is the fact that Lee is owed at least another $67.5mm until 2016 with a $27.5mm player option for 2017 that vests if Lee throws 200 IP in 2015 or 400 IP from 2014-2015. Assuming the Yankees stay committed to their aforementioned $189mm plan for next year, Lee is essentially a non-discussion by default and necessity. As for what the Phillies could receive, top prospects like outfielder(s) Slade Heathcott and/or Mason Williams would be a good place to start. Given their relief corp is atrocious, Adam Warren (3.11 ERA in 37.2 IP); Preston Claiborne (20 Ks in 24.1 IP) would be solid bets, as well as starter Ivan Nova (fourth in Rookie of the Year voting in 2011). Zoilo Almonte’s 124 wRC+ would be excellent for the future, as well. It all depends on what the final package is, but these names are the most likely to go. Four years after their World Series (which you can watch here), both the Yankees and Phillies find themselves in somewhat familiar territory; both have bedded themselves with terrible contracts, and both are also hurt under the parity of the new CBA. Although they don’t want to admit it to their respective fan-bases, both large market teams will need to undergo a rebuild sooner rather than later, and for the Phillies, this rebuild could start with some help from a New York team that’s expected to make one last push not only for the great Mariano, but for their declining core as well. In a season where its fate came down to the wire and the NHL almost started digging its own grave, the Chicago Blackhawks defeated the Boston Bruins 3-2 Monday night in Game Six of an Original Six Stanley Cup match-up that featured some Stanley Cup Final theater that hadn’t been since in almost two decades. 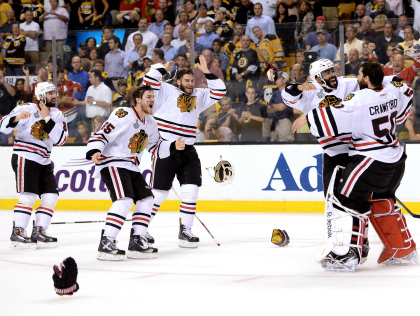 Winning two of their five franchise Stanley Cups in the last three years, the Blackhawks–who won the President’s Trophy–got off to a roaring start without a loss in their first 24 games, concluding their season in TD Garden in Boston. Giving the Bruins a 1-0 lead in the first period, 2011 Stanley Cup Winner Chris Kelly had a nice set-up from Tyler Seguin from the right circle at 7:19. Blackhawks center Jonathan Toews, who missed the third period due to an undisclosed injury in Game Five, netted the first goal for Chicago in the first. It was his second goal in the last three games. The Boston crowd started chanting “We want the Cup!” after a Milan Lucic go-ahead goal with eight minutes remaining, but minutes later, the arena would be empty, clad for a few Blackhawks fans. However, a flair for the dramatic–what defined Chicago’s season–would come around in the third period as Bryan Bickell would score at 18:44 with Dave Bolland giving the Hawks the 3-2 lead as the Bruins had just 59 seconds left until futility. An afterthought in their 2010 season, Blackhawks goalie Corey Crawford stopped 23 shots while his counterpart Tuukka Rask made 28. For the series, the Blackhawks outscored the Bruins 17-15, and although the Bruins were hoping from overtime, as in three of the first four games, it ultimately would not come. Of Chicago’s last 10 goals scored in the Final, Bruins defenseman Zdeno Chara was on the ice for nine; after the game, Bruins coach Claude Julien admitted Chara “wasn’t 100 percent.” Neither was Boston center and alternate Captain Patrice Bergeron. Although playing Game Six, Bergeron finished the season with a broken rib, torn cartilage, and a separated shoulder. Bergeron finished with four power-play goals for Boston in the playoffs, which is second best in Bruins franchise history. Blackhawks forward Patrick Kane won the 2013 Conn Smythe Trophy, which is awarded to the Most Valuble Player in the Stanley Cup Final. In Kane’s last eight games, Kane tallied seven goals, including an assist on Chicago defenseman’s Brent Seabrook overtime winner in Game 4. In Game 5 against the Los Angeles Kings, Kane netted a hat trick. The 24-year-old has a flair for the dramatic, including scoring the Stanley Cup-winning goal in Game 6 of the 2010 Stanley Cup against the Philadelphia Flyers. Chicago out-shot Boston 31-25, while Boston had the edge in faceoff wins, 36-28. Despite a champion now crowned, the NHL doesn’t have a long layover from the public spectrum as the NHL Draft kicks off in Newark at the Prudential Center this Sunday June 30. Losers of eight in their last 13 games, the New York Yankees certainly don’t look like the Bronx Bombers this season. 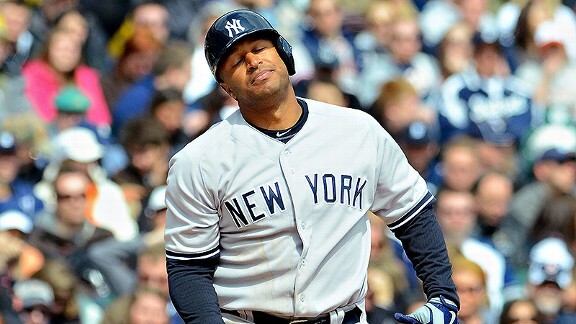 After squeezing the .911 OPS juice out of the seemingly rejuvenated Vernon Wells in April, the once-maligned-Angel has once again heard the cries of “he can’t hit!” after posting a .209/.237/.582 line since the calender flipped to May. Look familiar? Well, in his two seasons with the Angels, Wells posted a .222/.258/.409 line. Following his trade to New York, in which he posted an OPS+ of 115 in 67 games, Ichiro, too has turned back into a pumpkin, posting a slash line of .260/.294/.345, which looks awfully similar to the .261/.288/.353 line in his final 95 games with Seattle. Ichiro really hasn’t used one of his best assets as a slap-hitter, speed, either; his five steals put him on pace for 15 this season. For reference, he stole 14 in 67 games as a Yankee last season. As we’ve learned via Joel Sherman, the top of the Yankees hierarchy was behind giving Ichiro–who we can now say is just about finished–a 2-year $13mm deal. The thought process, clearly revenue-driven on the assumption Ichiro would earn his 3000th major league hit in pinstripes, has pretty much been squashed due to the lack of production. While the complaints last year had some bearing: “this team hits too many homers! Where are the go-ahead hits? !”, it would admittedly be pretty nice to have a consistent offensive threat in the outfield. Not a fan of Nick Swisher (and his .829 OPS?) Certainly, Josh Willingham’s career OPS of .842 of the Minnesota Twins could have been had in the off-season for a David Phelps or Adam Warren when you consider the Twins need pitching in just about every regard. Of course, Ichiro will (hopefully) be sat when Curtis Granderson and his 109 home runs in a Yankees jersey once again return from the Disabled List, but what happens if Vernon Wells is still in a rut? Is the right-handed power really going to reside in Lyle Overbay–who’s never played the outfield in his major league career? According to Ken Rosenthal, Russell Martin told the Yankees he was willing to take a one-year deal in the $10mm range, which would not only give the Yankees offense a boost, but not impact their projected $189mm mandate for 2014. Instead, the Yankees let him walk, and have received a 76 wRC+ from their catching position. Francisco Cervelli looked solid before he broke his hand in late-April with plenty of defensive swings as well as toning down his personality, but Chris Stewart, a career back-up, has been exposed. Lumping “championship-caliber” and Chris Stewart (career 63 wRC+) is hypocrisy in the highest regard. The Yankees apparently value Stewart due to his defensive prowess, but so far, Stewart has amassed a meager 0.3 dWAR in 32 games in 2013. Meanwhile, Russell Martin is OPSing .770 with a dWAR of 1.3. Current Yankees backup catcher Austin Romine looks completely over-matched, with seven total bases in 41 ABs. The reality is that this team is closer to Houston Astros offensive territory than their rival Boston Red Sox. The Yankees and terrible Astros both average 3.98 runs a game, while Boston is exactly one run better at 4.98. Both the Astros and Yankees have team OBPs of .306. Division rivals Tampa Bay and Baltimore Orioles are in the top five of OBP at .332 and .330, respectively. If the Yankees don’t pitch well–fourth in team ERA at 3.76–they don’t win. Simple as that. Seats still available! Plenty of empty seats decorated Yankee Stadium in the once-must-have-ticket Subway Series. 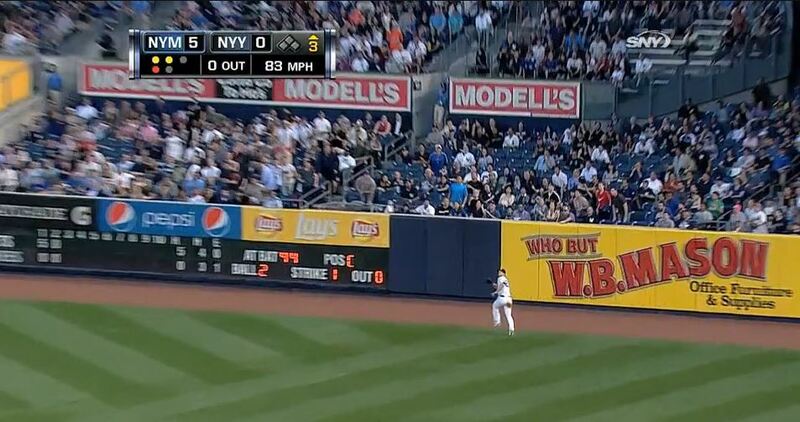 Fans have seemingly caught on as well; there have been two sellouts at Yankee Stadium this season. Two. Attendance as a whole is down eight percent, while YES Network ratings have dropped a whopping 39 percent. The Yankees Ticket Exchange has been a failure, with the team offering tickets on Groupon against the cross-town rival New York Mets for up to 50 percent off. Taking a look at their website, Stubhub sales haven’t been affected at all by the Ticket Exchange, which was a priority of the recent fan service, citing the convenience of the fans. At some point, one has to wonder whether or not Hal and Co. will abandon their $189mm plan given the declining attendance, overall apathy and lack of production from the team. As fun as those first few over-achieving April weeks were, the clock can’t stay fixated on 11:59 p.m. forever, and the Steinbrenners seemingly care about lining their pockets with Ichiro revenue than fielding a competent product. Yes, there have been tough breaks on the injury front (pun intended), but anyone with a decent baseball acumen could see that Chris Stewart and Ichiro are significant downgrades from their 2012 counterparts. If this were a storm, however, the offense would just be the rolling clouds; the actual rain not coming until next season when the Yankees figure to lose Andy Pettitte, (most likely) Hiroki Kuroda, Kevin Youkilis, Travis Hafner, Curtis Granderson, Phil Hughes, Joba Chamberlain and Mariano Rivera among others. That’s three rotation spots, the team’s only left-handed power bat not named Robinson Cano, a dual-corner infielder and set-up man, not to mention one of the best pitchers of all time. With teams locking up their aces to long-term deals over Spring Training (Wainwright and Verlander), the top name for the Yankees on the pitching market is the declining Tim Lincecum. With CC experiencing a decline in velocity, the Yankees better hope Hiroki Kuroda accepts another one-year deal, with Michael Pineda regaining his first-half-of-2011 form. Perhaps the only good thing about Granderon’s injury is that one of baseball’s true gentlemen will accept a one-year “pillow” contract similar to what Edwin Jackson took with the Nationals in 2012. Currently, the 2013 Yankees are on pace for roughly 660 runs, which should be surpassed given the returns of Jeter, Cervelli, Granderson and maybe Alex Rodriguez. Even if we plop an arbitrary number of 700 in their, the last time the Yankees finished with a sub-700 RS was back in 1992 with 733 runs. In Buck Showalter’s first season with the team, they would go on to finish 76-86, and the team’s offensive leader was right fielder Danny Tartabull (4.6 oWAR). The team stood pat in the off-season for the most part, and now the lackluster winter has turned into an even more depressing, slow offense complete with declining ratings and a lack of sales. The old Ichiro looks like a dog ready to be put down, Vernon Wells has unsurprisingly regressed, all while Hal and Co failed to address the team’s needs with adequate resources out there. This is a bit obvious, but did anyone really doubt Justin Upton would struggle in this new lineup? Two home runs on the season already, with two walks. If he keeps production like this up, it’s clear why Fredi Gonzalez has him penciled in the no.3 spot. Conversely, how bad does his brother, B.J., look? 0-9 as a Brave and was lifted for Jordan Schafer later in the game. It’s apparent he’s susceptible to breaking stuff away and he’ll need to correct the free-swinging approach. While the Braves will hit a lot of homers, they’ll also strike out a lot, too. 9 Ks against Halladay, 16 by Phillies pitchers and 24 in their first two games could be cause for concern if the Braves, who had six walks tonight (which would all score), didn’t walk. Totally different ballgame, totally different perspective. Roy Halladay is a changeup-curveball pitcher now. While that may have worked tonight against the mostly free-swinging Braves, it won’t for every team. Halladay’s next start figures to be against the New York Mets on Tuesday. While only two games in, the Mets lead the National League on OBP at .419. With three walks in 3.1 IP, Halladay is going to have to figure out how to deal with the reality– reduced velocity, and fast. In his last five starts against Atlanta, Halladay has an 11.57 ERA and is 0-3 against them. Alarming, considering they’re divisional rivals. Johnathan Papelbon was terrible last year in non-save situations, and it continued tonight as Jason Heyward finally joined the home run party; a two-run shot in the ninth, his first of the season. Nobody wants Delmon Young out in right, but John Mayberry Jr.’s adventure to rob Jason Heyward’s 9th-inning homer and Domonic Brown’s attempt on Gattis’ homer in the bottom of the fourth weren’t anything spectacular, either. Both managed to line up at the warning track, but neither really put much effort into catching it. It’s like they’ve caught the Bobby Abreu syndrome of being afraid of the wall. Speaking of which, how awesome is it that Evan Gattis’ first career hit was a home run off Roy Halladay? Y’know who else had their first career hit against Halladay? Freddie Freeman. Y’know who else had their first career hit as a home run? Jason Heyward, off Carlos Zambrano of the Chicago Cubs. If Gattis can continue to remain somewhat steady behind the plate, I wonder if Gerald Laird will have any presence on this team once catcher Brian McCann comes back, expected in late-April or early May following shoulder surgery. Tomorrow proves to be the final game of this opening series for the two teams. It will be Phillies LHP Cliff Lee (6-9; 3.16 ERA in ’12) against Braves RHP Kris Medlen (0.97 ERA as a starter in 83.2 IP last year). This game has all the makings of a pitcher’s duel and despite the 6 wins, Cliff Lee still had a nice season last year striking out 207 in 211 innings. The Phillies will then have their home opener at Citizen’s Bank Park while Atlanta welcomes the Chicago Cubs and Starlin Castro for a three game series. 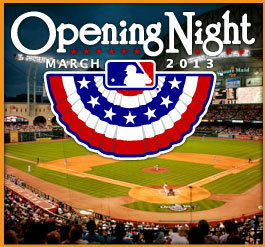 The 2013 MLB Season kicks off tonight at 8pm. It will be Texas Rangers LHP Matt Harrison (18-11 3.29 ERA for 2012) on the hill opposing Astros RHP Bud Norris (7-13 4.50 ERA in ’12). Borrowing a page out of CBS Sports, here are our predictions for divisional finishes, playoffs, as well as the awards which succeed the season as a whole. Feel free to comment your own predictions! Have a great Opening Week, baseball fans!